This special Nepal tour leads you to all different regions of Nepal. The trip starts in the capital city Kathmandu, which is located in the hilly region. Further you visit the Himalayan region, where you can get great views of the highest mountains of the world. After that, with a stopover in the beautiful, green area of Palpa you continue your trip to the Terai region, located in the south of Nepal near the Indian border. This region is fully different than the others. There it is flat, but if the weather is good, even from there you can see the high mountains of the Himalaya in the distantness. Everything is green, you can explore the wild jungle, ride on elephants, watch crocodiles while doing a boat trip on Rapti River and much more. After visiting Lumbini, the birthplace of Buddha, you go back to Kathmandu. The special thing of this tour is, that you don’t only visit the different areas of Nepal like a normal tourist does, you do it in a local style by staying in the house of host families, driving in local busses, and having some days of volunteering during your trip. By travelling like this, you experience the reality of Nepal, get to know different ethnic groups, interact with many different people, experience the traditional culture of the people and take part in it. During this trip you get an impression of the countryside, the culture, the lifestyle of the people, other tourists don’t get. We want you to experience the reality of this country, which is so rich in its landscape, its culture, its traditions and lifestyles and otherwise one of the poorest countries in the world. Experience the simple life of the people in the villages and be part of their society - not much possession but a beautiful hilly, green area around them, with no air pollution like in Kathmandu and the kindness and the positive thinking of the people who have so less wealth is incredible. Day 07: Visit the surroundings of Chisapani, amongst others the Maiti Nepal women project where they support people who have been sold to India for prostitution, often by their own father or brothers, and sent back because of AIDS. In the afternoon visit Goat Farming Project. Day 15: Full day in Palpa: Visit school in Palpa and interact with the children. Get knowledge about the school system in Nepal and inform them about yours. Visit hospital to get knowledge of the Health system in Nepal. (on the way you have time to think about the previous weeks. You can decide if you want to extend your journey to do more trekking or volunteering in another project. If you want to do Volunteering in one of the projects you have been visited during this trip, we can organize this for you. You have to pay an agency fee of 70$ and will stay as many weeks as you want in the project without organisation. You pay the family for example 1000NR for one day (accomodation and meals) and work in the project. So all money you spend will go directly to the family and the project which you have chosen. Day 22: Extension program or departure and flight back Home. I am sure you will remember this trip! The homestay is nice but basic and usually has squat toilets, electricity and running water. You should know that there are often power cuts that can last for 10-12 hours. You will stay in traditional guesthouses while trekking in the mountains. These facilities are basic and there is limited access to electricity. Internet: There is not always internet at the accommodation but you will have occasional access to WiFi. Arrival in KTM and transfer to Volunteerhouse/host family. This day is no programme. If you arrive in the morning you have time to relax or explore the area around your house. In the evening you have a welcome dinner with your host family. Today you visit the most important sightseeing locations of Kathmandu. After breakfast you drive to Swayambunath, the "Monkey Temple" of Kathmandu, a buddhist place of pilgrimage with a small stupa. There are many monkeys bopping around, so you should keep hold of your camera, mobile and other things, that the monkeys are not able to grab them with their speedy fingers. After that you visit Kathmandu Durbar Square with its pagodes, the home of the living goddess Kumari. Then you drive further to Pashupatinath. It is an important pilgrimage place for Hindus and a lot believer from India come there every week. There are lots of temples and at the shore of the holy Bagmati River, the believers burn there dead relatives. Then you go to the big stupa of Boudha, which is also known as little Tibet and enjoy your dinner at the rooftop of the hotel with view of the Stupa. In the morning you get a detailed briefing of your upcoming trip and the projects you will visit. You also learn the most important words and small sentences of the language and some cultural rules, which you should follow during your stay. After breakfast you explore the ancient kingdom Bhaktapur together with your guide. The gorgeous temples and artful woodcraft remind us of the past. You visit the Durbar Square, the Dattatraya temple and some other places. Then you drive about 30 minutes to the Changunarayan temple. It is the oldest Hindu temple in Nepal and temple of god Vishnu. Both Changunarayan and Bhaktapur are listed as a World Heritage Site by UNESCO. 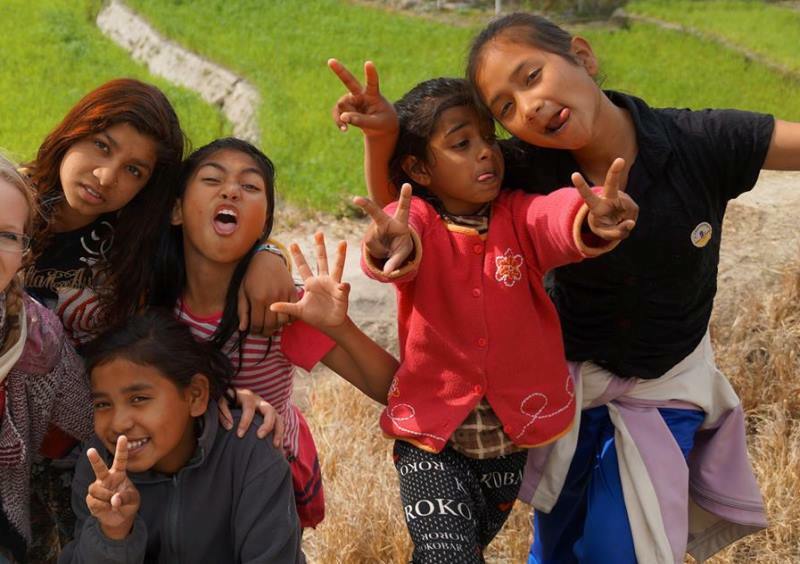 Today you are transferred to the orphanage in Sundarijal. There live 46 children, orphans or children, whose parents are very poor and can't afford the fee for school. You spend some time with them, talk or play with them and help with the homework or cooking. Today you spend time with the children and get to know there daily routine. Normally they get up about 5 - 5.30 in the morning. You can help in the kitchen and prepare breakfast for the kids. After that you can get them dressed for school and then walk them to school. Then you can help in the kitchen. One main task there will be peeling potatoes. To cook for 46 kids is a lot of work! You can also go with the people on the fields and work there. When the kids come back from school about 16pm you can teach them English and help them with their homework. You can also go to play football with them. There is a big playground about 6 minutes away from the orphanage by foot. 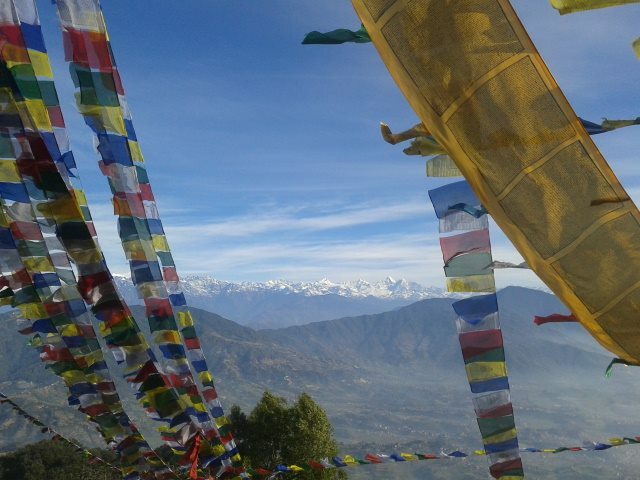 Today you hike to Chisapani, a viewpoint from where you can enjoy stunning mountain views of the Himalaya. You can also talk with the locals there. What are their occupations and how is their daily life there? If families in Nepal are very poor the parents or brothers sometimes sell girls to India or men promise them a better life when they follow them. The girls come for example to Mumbai and have to work as prostitutes there. They have a really bad life there, always in danger of beeing raped or getting AIDS. In this project are living women who were sent back to Nepal because they got AIDS. Some of them went back to their villages, but some of them are living in the project now. They have no real chance to marry in their life and it is difficult for them to live life now. Spend some time with them and ask them questions. Later in the afternoon you visit a farm with many goats. If you want you can help the locals with cutting grass or other farming activities. 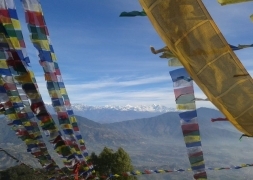 Today you hike Shivapuri Peak, from where you have again great views of the Himalaya. After that you go back to the orphanage in Sundarijal. If you want you can just relax or spend time with the children. Today you drive from Kathmandu to Kuringhat. If you want you can do rafting at Trishuli River. Then you drive further to Bandipur. It is located in a hilly region with fantastic views of the Himalaya. Today you drive to Dhampus. From there you can again enjoy the view of the Himalaya. Today you drive back to Pokhara. If you want you can walk this way. After that you have free time in Pokhara. Pokhara is a famous tourist town, because of its location at Phewa Lake and the good view of the Himalaya. You can explore the town by yourself or just relax. Today you have time for sightseeing in Pokhara. If you want you can do Paragliding in the morning. Then you hike to World Peace Pagoda from where you have a good view of Pokhara below you and the Himalaya in front of you, enjoy a boatstrip on Phewa Lake and visit Mahendra cave near Pokhara. If you want you can go out for eating in one of the good restaurants at the lakeside in the evening. Today you drive to Palpa, a hilly region with Tansen as headquarter. After arrival you explore Tansen. Today you visit the school in Palpa and interact with the children. Ask them about the school system in Nepal and inform them about the school system in your home country. The children will ask you many questions like 'how does it look in your home country, is it clean there, are there mountains, which food do you eat there' and many more. Later you get the chance to visit a hospital and get some insights about the daily work there. You can ask questions about the health system in Nepal, which is really different of that in Europe. Today you drive further to the south of Nepal, to Lumbini, the birthplace of Buddha. There you stay in a monastery and get to know the daily life of the monks. If you want you can relax or explore the area around the monastery. You have many opportunities to spend your time today. Do meditation in the monastery with the monks or go for sightseeing with your guide by driving in a Riksha or hire a bicycle. You can also go by foot. In Lumbini is a big park with many monasteries, sponsored by different countries of the world. If you want you can try to drive Riksha yourself. You also visit the birthplace of Buddha. Today you drive to a small Tharu village called Nawalparasi, located in Chitwan and secluded from the tourist areas there. You will stay in the house of a host family and watch traditional dances. Today you stay in Chitwan. If you want you can make an elephant safari and explore the jungle from the safe back of the elephants. You can also go with one member of your host family canoeing and watch the crocodiles. If you want, you can help them with fishing and you can prepare the meal all together in the evening. Sauraha is another village in Chitwan and a well-known tourist area in this region. You find a big variety of hotels and restaurants there and agencies which offer jungle activities. The village in that you stayed before is very small and a non-tourism area in which you could get to know the locals way of life. In the morning you do an elephant safari. From the back of the elephant you have the chance to see four different kinds of deer, rhinoceros, bore, monkey, leopard, sloth bear and if you are really lucky you can espy the impressive Royal Bengal Tiger. After having lunch you have a canoe ride along the Rapti River. An excellent opportunity for bird watching and watching the 2 species of crocodiles here; the Marsh Mugger and the fish eating Gharial very close to you. 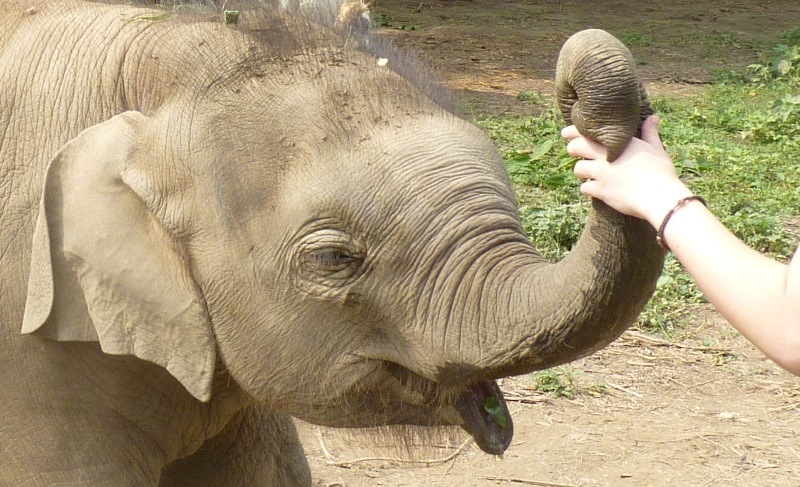 After that you will have a short jungle walk which leads you to the Elephant Breeding Center. If you like you can also go bathing with the elephants and in the evening enjoy the sunset at the riverside. Today you drive about 6 hours back to Kathmandu. On the way you have time to think about the previous weeks. You can decide if you want to extend your journey, for example do more trekking or volunteering. In the evening you go to the touristic center of Kathmandu, Thamel. There are innumerable shops, cafes and restaurants, a great place for shopping some souvenirs or gifts for your family at home - if you bargain good, the price will be very cheap. Then you have a farewell dinner there. (If you want to do volunteering in one of the projects you have been visited during this trip, we can organize this for you. You have to pay an agency fee of 70$ and will stay as many weeks as you want in the project without organisation. You pay the family for example 1000NR for one day (accomodation and meals) and work in the project. So all money you spend will go directly to the family and the project which you have chosen. We will advise you and answer every question you have! If you don't book an extension program, you are transferred to the airport and fly home. This gap tour in Nepal combinates the adventure of trekking in the Himalayas, Sightseeing in the different regions of Nepal and social work in diverse volunteer projects. Experience the vibrant culture, rich landscapes and hospitality of the Nepali people.